After US presidential candidates, Donald Trump and Hilary Clinton, met with the Egyptian president Abdel Fattah el-Sisi on Monday, the latter in an interview with CNN said he has “no doubt” that the Republican candidate Donald Trump would make a strong leader if elected in the November elections. Asked about the latter’s proposed immigration policy of “a total and complete shutdown of Muslims entering the United States” that has been watered down last month to “extreme vetting” to determine if they uphold US values before entering the country, President Sisi pointed out that campaign declarations and political realities are different things. The Egyptian president’s remarks could be seen as a boost to the Trump camp that stated that the US “will be a loyal friend – not simply an ally- that Egypt can count on us in the days and years ahead” if they are elected to the White House. President Sisi was not as appreciative of the Democratic Party’s presidential candidate as he is of Trump. 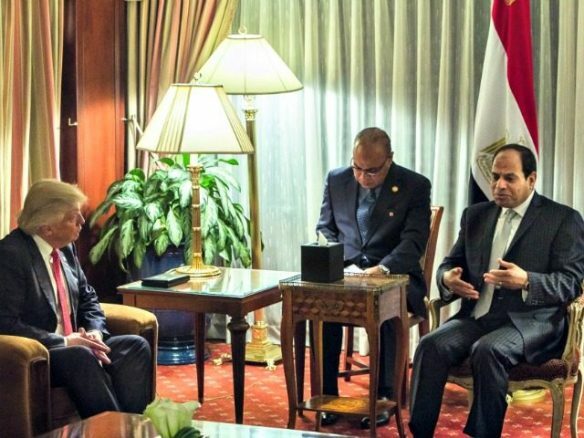 Egypt is a strategic ally of the US in the Middle East and North Africa as well as in the Arab World and the aspiring US presidents will need to work with Cairo to continue propagating their influence in the region. Written by: Peter Mulvany on September 22, 2016. Posted by Peter Mulvany on Sep 22 2016. Filed under Headlines, World News. You can follow any responses to this entry through the RSS 2.0. Both comments and pings are currently closed.